When we come to our conclusion, our solution, then we need to look at what logically comes next, or could happen next, if we act on that conclusion. It’s time to look at the Implications and Consequences of our reasoning. If your conclusion is correct, how might people think or act? Implications are what we think of next because of the Interpretations and Inferences we have come to. If we continue with the logic of our argument, then we think about the Implications, what follows logically from our line of thinking. These are ideas that come from ideas. 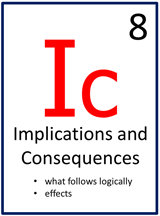 Consequences, on the other hand, have to do with actions, with what happens when we act on Interpretations or Inferences. It is about what we do because we have come to a logical conclusion. A consequence has an effect on how people act, actions that come from ideas. Always be sure that your Implications and Consequences make logical sense, that they follow from the sound reasoning you have done with the other Elements of Thought. You can even use your own experience to help identify Implications and Consequences. Also, some Implications and Consequences may be very subtle, so take your time and think carefully. They may be only hinted at or suggested by the Interpretations or Inferences. When you have reasoned well, look for the Implications of the Implications and the Consequences of the Consequences.